Applications on Mac OS typically include a lot of stuff most people won’t use daily, especially translations in foreign languages and builds for different architectures (x86, x86_64, PPC and PPC 64 bits). A handful of utilities exist to trim down applications. I personally use Trimmit, a free-as-in-beer software that gives excellent results, as long as it’s used carefully. 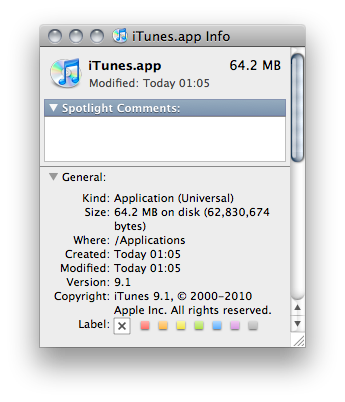 For example, let’s take the latest version of iTunes (v9.1) under Snow Leopard. 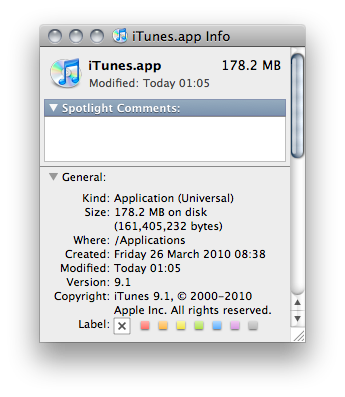 Trimmit already cut iTunes size by nearly two thirds (! ), and iTunes works flawlessly. That’s about the best results I’ve had with Trimmit, because things get ugly if you want to squeeze it too far. That’s another 17MB trimmed… But this manipulation breaks iTunes code signature. Which will -if you run OS X firewall, like everyone should- trigger a message asking you if you want to allow iTunes to connect to Internet each time you run it. Still seem a bit big? Well let’s check every option in Trimmit and go for it. That’s 100kB more freed, but now iTunes crashes at startup. Seems that “useless files” aren’t that useless after all. It’s important to keep in mind that Trimmit doesn’t work well with any applications. You should be particularly careful (read: do not try) with Adobe applications and other applications on the blacklist. But overall, the extra space can be a very good thing, especially on small partitions and/or on SSDs.